My Husband's Cancer & Starting Over: There's Danger At 38 degrees Celius !!! It's always good to share your knowledge of things that you learn and encounter along your journey with cancer. So, today my topic is all about temperature. Now, I'm not talking about the outside temperature, although with the beautiful summer weather at this time of year, many of you just might be enjoying very hot temps of 38 + degrees, especially if you live around Western Canada and many other areas of the US. The temperature I'm referring to, is your body temperature and more specifically, your temperature as a cancer patient if you are presently taking any type of treatment. Fever in cancer patients can be caused by a number of reasons such as allergies, types of medications you may be taking or tumor association just to name a few, but primarily a fever means you have INFECTION and that's not something to ignore. How do you contract an infection you might ask? If you are having radiation or chemotherapy treatments, overtime it may cause your white blood cell count to decrease. A low white cell blood count means you are more susceptible to develop an infection. This of course is just one such cause for infection, so "always" check with your doctor, as I'm no medical expert, but I do relay experiences that we have encountered along this cancer journey. Keep a thermometer handy to check for elevated fever when on chemo or radiation treatments and if it should rise to 38 degrees Celius, then your first stop should be your doctor's office or hospital emergency room without delay!!! This is very important! Infections can lead to other symptoms such as low blood pressure, dehydration and possibly failure of your only remaining kidney if you have had a nephrectomy. My husband encountered all of these first hand earlier this year, so I know all to well about what can happen when you ignore that high fever. You may first feel cold, then warm, come down with chills or like my husband, suddenly develop violent shaking and vomiting. If this happens,, please seek medical attention immediately. Now, my intent here is NOT to alarm anyone, but I do want to impress the dangers involved anytime you ignore a high fever. Your oncologist probably has already alerted you to seek medical advice if your temp elevates to 38 degrees Celius or higher, so please take his/her advice. My husband was very lucky that he arrived at the emergency room when he did, and received excellent medical attention. 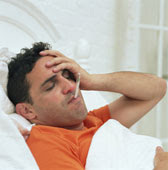 One more note if you should develope a fever and have to be admitted to hospital. "Please" keep visitors to a minimum, as the more people you have around you, the greater your chances are of not getting rid of that infection as quickly. After all, when you are ill, you really don't need visitors, but lots of rest and sleep. That's natures way of healing. Also, when in any hospital, it's very easy to contract C-DIFF ( a type of infection very easily contracted in hospitals when your resistance is down). My way of trying to reduce my husband's chances of possibly coming down with this very serious infection was to disinfect "everything" around him from the bed rails, to the telephone, hospital trays, side table, etc..etc....Remember, you just can't be too careful, as hospitals are a good place for infections to roam. I'm happy to report that my husband spent one week in hospital before he was released with all infection finally gone! It took awhile to get back on track again, but the good news is that he did!!! 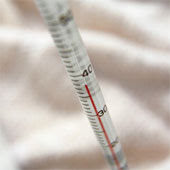 Keep that thermometer handy just in case you suspect you may be developing a fever!! !